Bradburn, Jamie. "Toronto Feature: Ward's Island (en anglais seulement)". The Canadian Encyclopedia, 02 juillet 2015, Historica Canada. 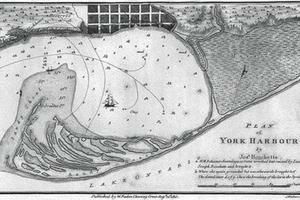 https://www.thecanadianencyclopedia.ca/fr/article/toronto-feature-wards-island-en-anglais-seulement. Accessed 22 avril 2019. "Storm Separates Toronto from Islands"
On the morning of 13 April 1858, hotelkeeper John Quinn and his family prepared for a party to reward the workmen who had rebuilt his hotel after two years of storm damage. Quinn's Hotel was situated in an increasingly precarious location: the eastern narrows of a long sandbar stretching into the harbour that locals dubbed "the peninsula." What are today the Toronto Islands were formed over millennia by sand being pushed out into Lake Ontario by the Don River. The sand first formed a long peninsula-not an island at all. In 1853, the same year Quinn bought the former Peninsula Hotel, the first major breach of the narrows connecting the peninsula to the mainland occurred. While intervening breaches were repaired, officials dithered over whether to provide permanent protection to the peninsula or to let nature take its course. During the party preparations in April 1858, a severe storm approached. Quinn, accompanied by his seven-year-old daughter Jenny, ferried the workers back to the city. After a difficult journey back, John and Jenny found the rest of the family clinging to boards amid rising waters. Quinn's wife never recovered from the shock and Jenny was sent to live with relatives in Rochester for a year. The fury of the storm carved a channel nearly 1.5 metres deep next to the hotel. 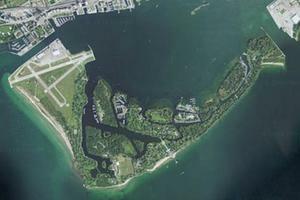 This breach proved permanent--within a month, steamers were able to pass through an eastern gap, and the peninsula had become Toronto Island.